562 pages | 9 Color Illus. | 26 B/W Illus. The rapidly evolving field of nanomedicine refers to the clinical application of nanotechnologies. However, as with all new technologies, there are ethical, safety, and regulatory issues. This handbook, written by leading international experts, provides a meticulous overview of the state of the art of safety assessment of nanomaterials (nanotoxicology) in the context of their application in nanomedicine. The volume includes a historical perspective on the development of nanomedicine and its regulation, and a personal view of the future of (nano)medicine by Patrick Hunziker, president of the European Society of Nanomedicine. Ethical considerations in relation to nanomedicine are discussed. There are a series of chapters on organ-specific toxicities of nanomaterials, including pulmonary and cardiovascular toxicity, neurotoxicity, dermatotoxicity, and reproductive toxicity, as well as a discussion on immunotoxicity and genotoxicity. The importance of a thorough characterization of physicochemical properties of nanomaterials is emphasized. The handbook also contains a critical discussion on the applicability of in vitro versus in vivo methods and models for nanosafety assessment, along with an introduction to mathematical modeling approaches with a view to a predictive toxicology of nanomaterials. The overall aim is to provide a comprehensive, science-based framework for safety assessment of current and future nanomedicines. 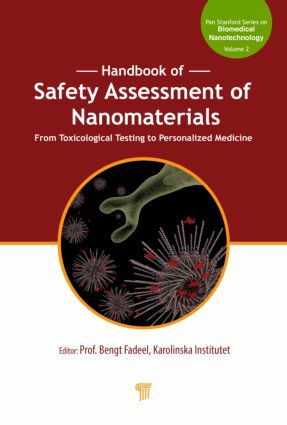 "The Handbook of Safety Assessment of Nanomaterials: From Toxicological Testing to Personalized Medicine provides a comprehensive overview of the state of the art of nanotoxicology and is a unique resource that fills up many knowledge gaps in the toxicity issue of nanomaterials in medical applications. The book is distinguished by up-to-date insights into creating a science-based framework for safety assessment of nanomedicines." Bengt Fadeel is professor of medical inflammation research at the Institute of Environmental Medicine, Karolinska Institutet, Stockholm, Sweden, and adjunct professor of environmental and occupational health, University of Pittsburgh, Pittsburgh, PA, as well as visiting professor at the University of Rome "Tor Vergata" in Rome, Italy. He obtained his M.D. and Ph.D. from Karolinska Institutet. He received a six-year Senior Investigator Award in Inflammation Research from the Swedish Research Council and the national Environmental Medicine Prize in 2011 for research on the risks and opportunities of nanotechnology. Dr. Fadeel is a Fellow of the US Academy of Toxicological Sciences (ATS), director of the Nanosafety & Nanomedicine Laboratory, and head of the Division of Molecular Toxicology at the Institute of Environmental Medicine. He is the past coordinator of the FP7-NANOMMUNE consortium, which focused on the hazardous effects of engineered nanomaterials on the immune system, and is currently engaged in several other nanosafety projects, including FP7-MARINA, FP7-NANOREG, FP7-NANOSOLUTIONS, and FP7-SUN, as well as the European Flagship Project GRAPHENE, and the national MISTRA Environmental Nanosafety consortium. Dr. Fadeel served as co-chair of the 7th International Nanotoxicology Congress in Antalya, Turkey (2014).